The wedding breakfast and speeches are very traditional and important parts of the wedding day. 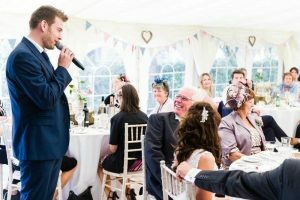 Having acted as a host for many a wedding breakfast, Alex has a wealth of experience in bringing a fun and personal approach to these otherwise ‘formal’ proceedings. From introducing you as couple or the whole wedding party into the room in a upbeat way that will create an electric atmosphere with you and your guests as dance your way to the top table through to the introduction of the speeches themselves. Alex will also be on hand on the day for each individual speaker giving them help and advice to steady the nerves as well as introducing them into a wall of applause and laughter. As well as introducing the wedding party and looking after speeches we can have so much more fun with the hosting element of the wedding breakfast making it more memorable and interactive with certain games like ‘Mr & Mrs’ & ‘Beat the intro’ music quiz to name just a few ideas. When Alex acts as your Wedding Host he’ll go through the wedding breakfast to personalise the hosting elements to best suit your wedding party when you meet for the consultation. Even if the venue include a host or toastmaster why shouldn’t you just stick with them? Here’s a bit of raw phone footage we took from the wedding breakfast at a recent wedding. This demonstrates what atmosphere can be had and why being creative with the intro songs can really add an atmosphere. We also did the beat the intro game competing for a bottle of fizz and then to finish off we ended up getting everybody stood on their seats for a wireless sing a long which was brilliant. Alex will act as your wedding host as part of any day / full day and evening package. Want to see the atmosphere of some great wedding breakfast entrances, then check out some of these full day videos, with more available on the facebook page.